Here at Dancin' Dogg Golf we frequently get requests to recommend the best computer to get to run OptiShot, or what are the specs for the optimal setup, not just the minimum requirements, but the best possible setup. Because there are so many different types of computers and different configurations, this question is impossible to answer specifically. However, we can give general ideas on what to look for. If you want to check a computer you already have to see if it will run OptiShot, please go to this page: Will My Computer Run OptiShot?. 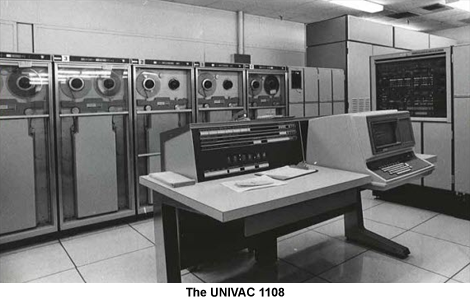 Oh, by the way, the Univac 1108 pictured here will not run OptiShot. It has only 512 KB of RAM and a 100 MB hard drive. It also doesn't have a video card and no USB ports! Still, at $1.6 million it is a sweet machine! This is the amount of memory the computer has. The minimum requirement is 4 GB. However, OptiShot, and all other programs, can only use the Available System memory. Windows will use some of the memory, if you have other programs running they too will use some memory. If the computer has 4GB of RAM but only 3.2 GB of available memory, OptiShot is going to have a difficult time and might appear "choppy" or slow and may not run at all. You can not have too much system memory! If you get a computer with 8 GB of RAM, there will be plenty left over for OptiShot to use. You can even get more memory than that; your system and OptiShot will run smoother for it. This is memory that is available to the video card itself. The minimum requirement is 256 MB. As with system RAM, you cannot have too much video memory. OptiShot will run with 256 MB of video memory, but you can take that up to more than 1 GB of memory. The more memory, the smoother the display. This is the most troublesome aspect of OptiShot and graphics. We have seen many "new" computers that turn out to have 2 or 3 year old video cards and many of the cards simply cannot handle OptiShot's graphics requirements. When considering a new computer, find out exactly what model of video card the computer has. Using that information, go to the video card manufacturer's website and find out when the most recent software was released for that card. If you find a card that has enough memory, but the company hasn't updated its software in two years, you probably don't want to get that card. It's too old and may not run OptiShot let alone other graphics intensive programs. Some video card companies update the software for their cards all the time, some do not. You need to do a little research on the card itself to find out if its a legacy card - an old card that will never be updated - or is a card for which new software is still being written.